Testing the heat treat on the 4130 , made this little hunter. I hope the heat treat works out. 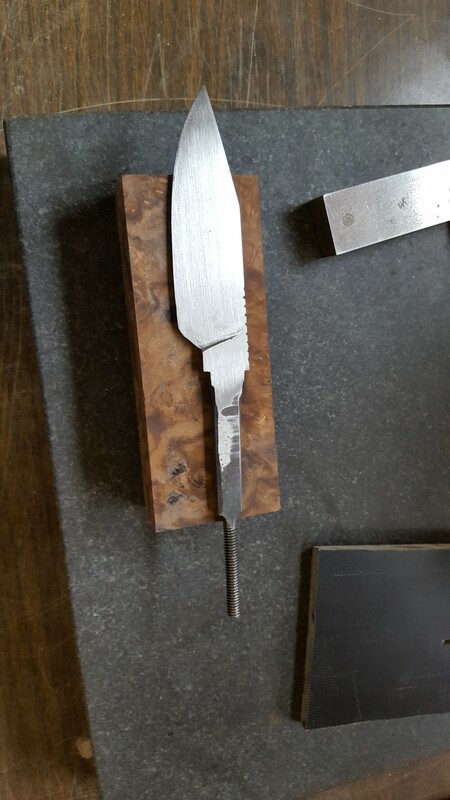 That is going to be a very nice knife. I am a big fan of this type of build. Thanks Dennis , I am going to give this to my cuss who does a ton of hunting, he will give a workout. Very nice, if that is the handle block under it, it will be a beauty! 4130 for a knife blade huh? Interesting. I didn’t think the popular alloys for firarms could reach adequate hardness for an proper edge. Looking forward to seeing the outcome. I was wondering the same thing? I thought 4130 topped out at about 50 RC? prolly a nice tough knife but edge holding? If my memory is correct a cold treat will help it also? My question is how will it hold an edge , at only .25 to .33 carbon we will see , making a few blades to test. Ken , thanks for the info I am going to go the super quench as outlined in the article. The second blade I am making I will quench in the fast quench oil I get here in Detroit. The answer as to will it harden is answered , yes it will harden how hard is another question . I did not temper the blade as per the recommendation I found at a machinist forum and snapped the thread off the tang , that is now fixed and the blade is going in for a one hour temper maybe two cycles. Fred, can you do Rc testing? I've read RR spikes can hit 50 Rc or so with that super quench stuff. While 50 Rc isn't really "hard" for high end knives, it's amazing how many older carbon steel knives were not much more than that. Ken I can not do testing , one of those wish list items but a good sharp file skates over the edge. I have a friend that has a machine shop and he may have a hardness tester I will give him a call. This is exactly what I want to learn how to make. Question... what made you try the 4130? Kevin , I bought a coil spring at a yard sale because the deal was to good , spring is 3.5' x 12'' x 1.5'' thick . had a small chunk tested and turned out to be 4130. Ah yes I remember now. I bet it’s going to work out ok. They may just end up being really easy to sharpen.